The area around the Grassy Hut is less frequented by heli skiers and snowmobilers than the other huts; it is the quietest venue on the Bonnington Traverse. Also, there is a two hectare area around the hut designated for non-motorized use. 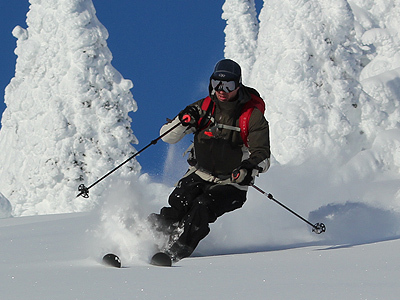 The area offers a mixture of gentle and moderately steep ski touring terrain with plenty of options for when the avalanche danger is higher. That being said, there are also some more aggressive terrain options for when the avalanche danger is lower. 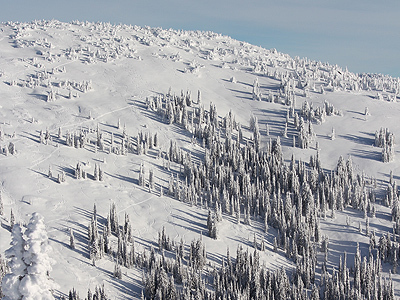 The terrain characteristics here include: good tree skiing, sub-alpine meadows and bowls, along with many steeper avalanche paths. Note that the terrain around the Grassy Hut has not been rated on the avalanche terrain exposure scale (ATES). We want to hear about your adventures in the Selkirks so don’t forget to post a trip report in the backcountryskiingcanada.com forums. If you have a new route in the area you want to share, mouse-on over here. N-Joy. All routes listed here provided by an anonymous powder junky. If we have missed anything please let us know? For a full listing of backcountry huts, cabins and lodges check out the Interior Mountain Lodging page over here and if you are looking to stay at Grassy Hut have a watch of our video here. 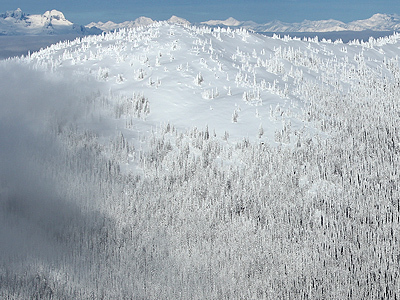 The open meadows and avalanche paths on the south face of Grassy Mountain offer up some fantastic skiing when the avalanche danger and ski quality are right. You need to be quick though as this south- facing aspect gets sun baked quickly - particularly in March. 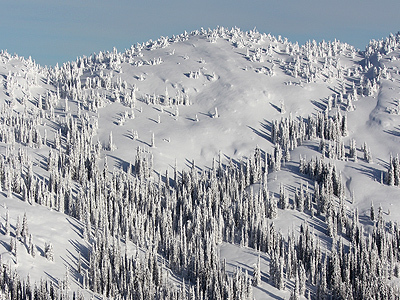 Make a safe up-track from the cabin up the face of Grassy Mountain using the islands of safety (trees) as your guide and only when you are certain of the avalanche danger. 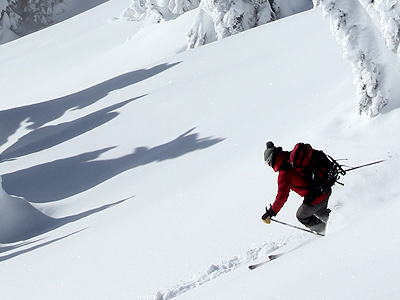 The ski down is the perfect pitch, wide open and sparsely gladed. 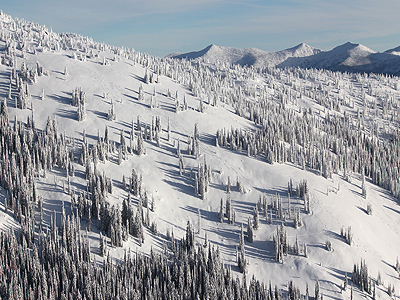 If you crave more vert try "Get Bent" to skiers left, more of the same only a touch longer. The same aspect as "Freshly Mowed" but a few hundred feet more makes this a popular route. Be aware that all this wide-open goodness was created by slides and that you end up in a run out zone, so caution is always a must. This face is large enough for a group of six people to lap all day - just be weary of winds as they tend to scour the upper ridge (and sometimes the entire face), so if the snow is good and safe get to work. This is the longest descent off of Grassy Peak at 1640' and by far the best line - but be cautious as it is also one of the most exposed. "Green Mile" is far skiers left of "Get Bent"; however, if you get your logistics just right you can use a single up-track to ski all three routes on Grassy's south side. This route is longer than the previous two by a few hundred feet, and slightly steeper, which makes it a crowd pleaser when conditions are on your side. 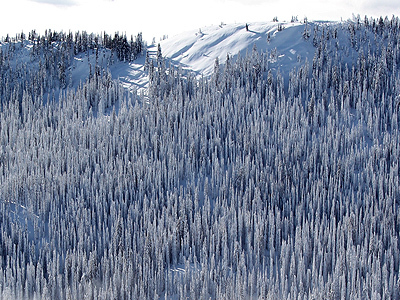 The skier’s right-hand side of this basin, from the top of False Grassy, provides some gentler open tree skiing. The snow quality on this side will persist longer and is less likely to get sun baked because it faces more to the north-east. When conditions are not optimal this is the place to be; however, it is shorter, not as steep, and slightly more treed than the south face of Grassy Mountain. This route drops off the ridgeline south-west of the cabin extending from the peak known as False Grassy. You will be skiing east towards the valley bottom once you leave the ridgeline just before you come to the southern most tip and the large clearing with good views to the south. The skiing is steep and open for a few turns at the top so be aware of avalanche possibilities. It starts to mellow out once you get into the trees. Pick your lines wisely as you can end up in thicker trees if you are not careful. Ski to the valley bottom and the headwaters of Grassy Creek, here you will be just a few hundred feet below the cabin. 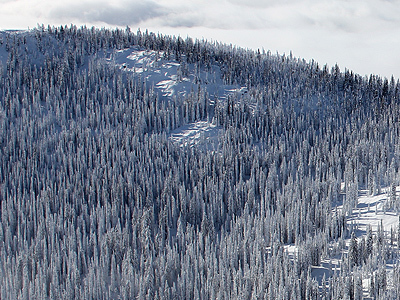 "Gilly Gally" starts from the summit of the ridge line behind the cabin and to the south. Similar to "Crabby," this one drops off the ridgeline to the east and takes you down into the valley to the headwaters of Grass Creek. The skiing is steep and open for a few turns at the top (so be aware of avalanche possibilities) then it starts to mellow out once you get into the trees. Pick your lines wisely as you can end up in thicker trees if you are not careful. You will end up well below and down valley of the cabin and in approximately the same location as the end of "Get Bent" if you get it right. Sunnyside is located on the south aspect of where "Gilly Gally" and "Crabby" drop in and it’s a good long fall line pitch in open meadows. Be cautious here as this aspect does get sun baked and is prone to slide given its open terrain and steepness. 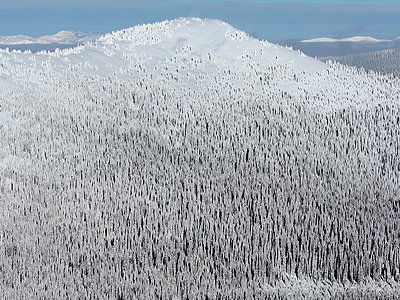 Play it cautious, ski the trees and you will be rewarded with a 1300' run with full views of Red Mountain Resort in the distance. Lap it back up in the trees the same way you accessed Grassy hut and repeat as needed. DFH is located skier’s right of Sunnyside" and provides pretty much the same aspect, length and pitch but faces just a few degrees more west - and has a few more trees for safety – but, as always, know the snow before you go. After a good solid fall line 1300' ski, skin back up in the safety of the trees and go again - lots of room for everyone. 7K is a solid route on the gentler but denser treed slopes on the west side of “False Grassy” (the route you ski toured in on to arrive at Grassy Hut). 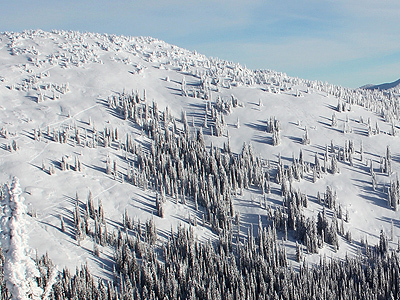 With its west aspect and fairly treed slope, 7K holds its snow well and avoids the sun bake - at least in early season. Both "Tweedle D" and "Tweedle Dumb" are 4km tours to the north of Grassy mountain on Twin Peak and are considered day trips given their location to Grassy Cabin. You can ski down the north south ridge on the back side of Grassy Mountain once you gain the col between Grassy and False Grassy Mountain. 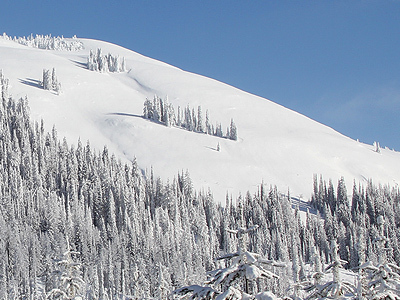 From here you can see your objective so the ski tour over is fairly routine; however, the slopes are sparsely treed so be aware of the terrain you are entering and your risk. It is always a good idea to take note of your route and use a map and compass or GPS to ensure you know the way back. Fresh snow and thick forest in the valley can make this an unpleasant surprise after a good ski.
" Tweedle Dumb" is located skier’s left of "Tweedle D" and provides a slightly longer ski (200' more) but this route is slightly steeper and has a few convex rolls to look out for. You will know you are at the end of the route when you hit the snowmobile road that you saw when you ski toured across from Grassy Cabin. 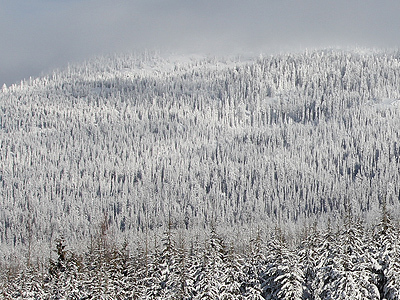 On the north side of Grassy Mountain, just west of the summit, you will find "Sledden" which is a mixture of steep open trees and avalanche paths down towards Grady Lake. The skiing is typically wind loaded and steep so be sure to know what you are getting into before you go - avoid the obvious open slide paths and you will enjoy a good ski down 725' to the valley bottom. To gain the ridge for a second lap, put your up-track in to the west where you will meet the gentle ridge which brings you back up to the col between False Grassy and Grassy Mountain. On the back (north) side of Grassy Mountain summit is ”Greedy Grady," a steep, open treed route down towards Grady Lake. 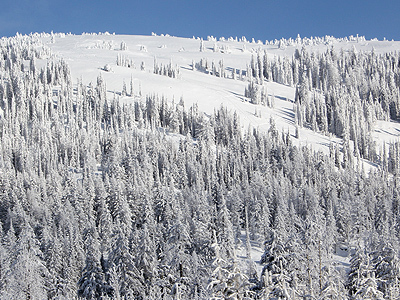 The skiing is typically wind loaded and steep so be sure to know what you are getting into before you go - avoid the obvious open slide paths and stick to the trees. This route is slightly steeper and longer than "Sledden" and a good ski when conditions permit.